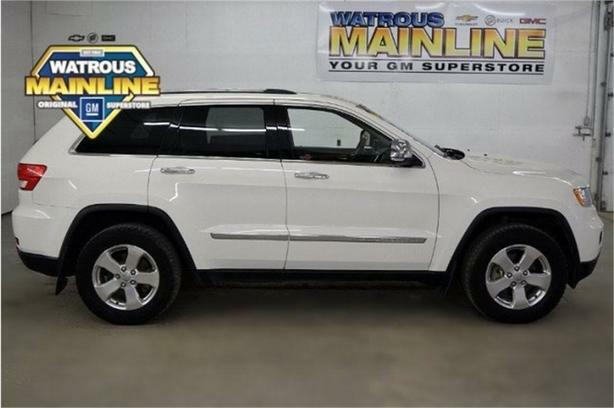 Check out this 2011 Jeep Grand Cherokee Overland. Its Automatic transmission and Gas V6 3.6L/220 engine will keep you going. This Jeep Grand Cherokee features the following options: OFF ROAD ADVENTURE II -inc: front suspension skid plate, fuel tank skid plate shield, transfer case skid plate shield, underbody skid plate, 18 x 8.0 polished aluminum wheels, ront tow hooks, 5-SPEED AUTOMATIC TRANSMISSION (STD), 3.6L VVT V6 ENGINE (STD), 26P OVERLAND CUSTOMER PREFERRED ORDER SELECTION PKG -inc: 3.6L V6 engine, and Wood & leather-wrapped steering wheel. Test drive this vehicle at Watrous Mainline Motor Products Ltd, 208 1st Avenue East Box 70, Watrous, SK S0K 4T0.